Tracey Brophy Warson is the Head of Citi Private Bank, North America and is a member of the Private Bank Global Leadership Team. In this role, Tracey is directly responsible for leading the Ultra High Net Worth and Law Firm Group private banking activities in 25 offices throughout the United States and Canada, overseeing greater than $244 billion in assets under management as of 2nd Quarter 2017. Tracey and her management team are instrumental in strengthening client relationships, enhancing products and services, and retaining and attracting some of the industry’s leading intellectual talent to the firm. In addition, Tracey is co-Chair of Citi Women, Citi’s global company-wide effort to focus on the advancement of women as leaders and business drivers. Tracey has nearly 30 years of experience working with ultra high net worth individuals, families and institutions. Prior to being named head of the Private Bank in North America, Tracey was Western Global Market Manager for the Western U.S. In this role she oversaw Private Banking in Beverly Hills, Los Angeles, Orange County, Palo Alto, San Francisco, Phoenix and Seattle. 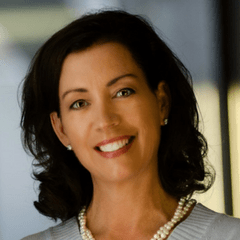 Before joining Citi in 2009, Tracey served as West Division Executive for US Trust, Bank of America Private Wealth Management where she built and ran the Western Region. Prior to joining US Trust she was Executive Vice President and Regional Managing Director of Private Client Services at Wells Fargo Private Bank. In this role she was responsible for Wells Fargo’s investment management, trust, private banking, wealth planning and brokerage businesses in the Bay Area. Previously Tracey served as an Executive Vice President and Head of Sales and Distribution for Wells Fargo’s foreign exchange and financial risk management businesses nationally. Prior to this Tracey worked in the investment banking division of Citi in Los Angeles and started her career in banking as an International Banking Officer at Toyo Trust & Banking Company in Los Angeles. *Between 2005 and 2013 while working in San Francisco, Tracey was recognized every year as one of “The Most Influential Women in Bay Area Business” by the San Francisco Business Times. This award highlights women who are active leaders both in their industry and the community. In 2013 she was selected as an Honoree and inducted into the Academy of Women Leaders by the YWCA of NYC which recognizes the outstanding accomplishments of trailblazing women in business. In 2015, Tracey was selected as an honoree on the New York Business Journal’s “Women of Influence” list, appeared on Private Asset Management’s list of the “50 Most Inspirational and Influential Women in Private Wealth.” In 2015 and 2016 Tracey was recognized by American Banker as one of the “25 Most Powerful Women in Finance”. In 2017, she was once again selected by American Banker as one of the “25 Most Powerful Women in Finance” and in 2016 accepted a three-year term as a National Trustee for Boys & Girls Clubs of America.